On Remembrance Day, at the Memorial, I thought of my paternal grandfather, Taeke van Popta, who died during WW II in Sachsenhausen, a concentration camp near Berlin. Taeke was involved in the underground movement against the Nazis. He was betrayed by the Nazi-sympathetic mayor of IJmuiden, the Netherlands, and died of dysentry. After the war, the mayor was tried, convicted and shot for his crimes, inluding the betrayal of Taeke. 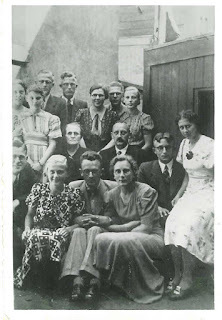 My grandfather is seen sitting here in the middle of his family in happier times. Thanks for that, George. Your grandfather paid the ultimate price -- something we can honour and give thanks to God for. It would be great if we could read more such stories, not just from you, but also from the younger generations. That "certain member" :-) is named after a very honorable man. Thanks for sharing this story, it really brings it closer to home when someone you "know" was involved. My grandparents survived the war, but were too young to really be involved like your grandfather was. It is also great that you have this photo of him and that it wasn't destroyed along the way. My mother is at the top left; my father is beside her.